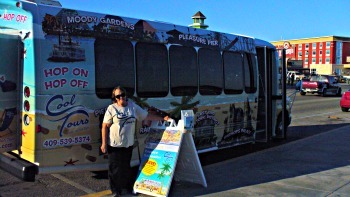 Galveston’s Cool Tours is two thumbs up! Great service! Cool Tours two thumbs up! The tour I was waiting for cancelled at the last minute. So I called Cool Tours and asked for a motel pick up. They accommodated me. And even called me when the bus as running late. Shortly afterward I received a call from dispatch. They told I missed the pick-up. But it was coming back in a few minutes! Wow this was great. In about ten minutes it arrived. A quick swipe of my debit card and we were on the way. Fun map in hand we were rolling! Each of us received a free fun map and bottle of water. This fun map is exactly that. It’s a visual guide that is fun and easy to use. Just glancing at it shows the Islands highlights. You quickly spot where to: play; fish; eat; shop and sight see. 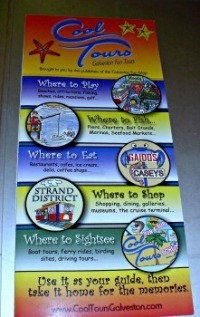 It’s a great way to see the island at a glance. The three rides available are: Single Ride; a 24 hour pass; or a 2 day combo pass. Riders over 55 receive a discount. Kids are $5.00 for the day or $10.00 for two days. Children under 3 are free. You want a two day pass to explore the City. The 24 hour pass doesn’t mean the bus operates during the night. The tours start about 11:00 AM, and end around 4:30 or 5:00 PM. If you hop off it takes about an hour and a half to get picked up again. That’s perfect. Get dropped off on the Strand. Shop, stroll or dine. The flexibility is nice if you stay longer. There are plenty of attractions. Take three hours! The Hop on Hop off tours is a perfect start! We toured the East end historical district. 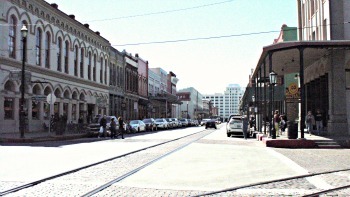 The all-important Strand, and Post Office Street. And there is plenty in between. The beautiful wood carvings were so intricate. And those wonderful Victorian homes! I keep thinking Oh I like that one. Then Oh I really like that one! We went by homes of famous islanders. Like who? Like King Vidor. He played a key role in the Kansas portion of the Wizard of OZ! Imagine that. He was from Galveston! That's the Tin Man in the above picture. 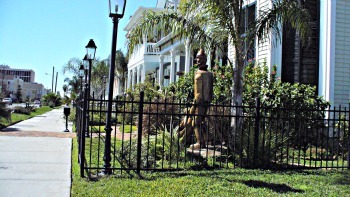 You’ll see the home of world’s first, heavy weight boxing champion, The Galveston Giant. Plus the homes of magnates and millionaires. One home is valued at $16,000,000! Some of the owners arrived on Galveston penniless. Our guide revealed some intriguing bits. Like the Flying Dutchman being sighted twice in Galveston bay 1892. That is a legendary ghost ship from the 1750’s. 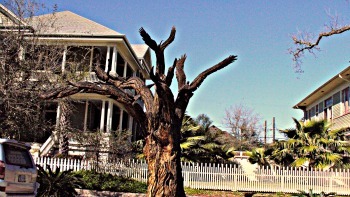 Well Galveston is one of America’s most haunted cities. Most haunting is believed to be from the great storm of 1900. During this hurricane 6 to 8,000 lives were lost. We also heard a hot rumor. 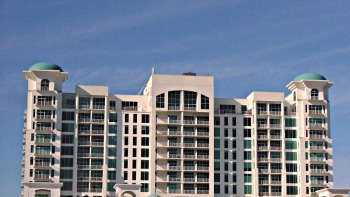 Beyoncé’s purchased this entire top floor. We’ll keep an eye out for the black limos. This year’s Mardi gras attendance exceeded New Orleans! Yes you read that right. Over 250,000 revelers came to town for it. Seawall Boulevard was closed twice Saturday and Sunday. Then huge parades marched over an hour each time! The bus is new. It’s comfortable and clean. When anything does off schedule people communicate! Calls to the driver make sure you got on! Cool Tours, Hop on Hop off Tour made me feel my time was important. And that I was a valuable customer. That is refreshing! The tour guide and destinations brought it all together. Cool Tours Hop On Hop Off Tours. 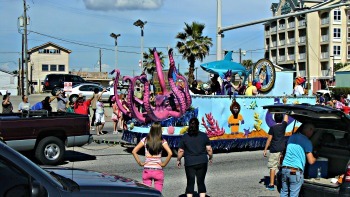 Leave Cool Tours and return to Galveston Travel and Charm Homepage.